The Don Haskins Center, home of the UTEP Athletics Men’s and Women’s Basketball teams, is named after the legendary UTEP basketball coach. Used as a basketball facility, it has a permanent hardwood floor with Safeguard floor covering and is configured as a 127′ x 84′ octagon. The center is also one of the most flexible performance arenas in the Southwest. It features 11,619 permanent seats, 36 wheelchair spaces, 800 portable seats in the round, and 7,000-9,000 seats with end-stage seating. Acts that have appeared at the center are varied and include: Santana, Metallica, Rod Stewart, Luis Miguel, Juan Gabriel, Coolio, Aerosmith, the Scorpions, Ozzy Osbourne, Vincente Fernandez, and Crosby, Stills and Nash, as well as the Harlem Globetrotters, the Royal Lipizzaner Stallions, World Championship Wrestling, and preseason NBA games. 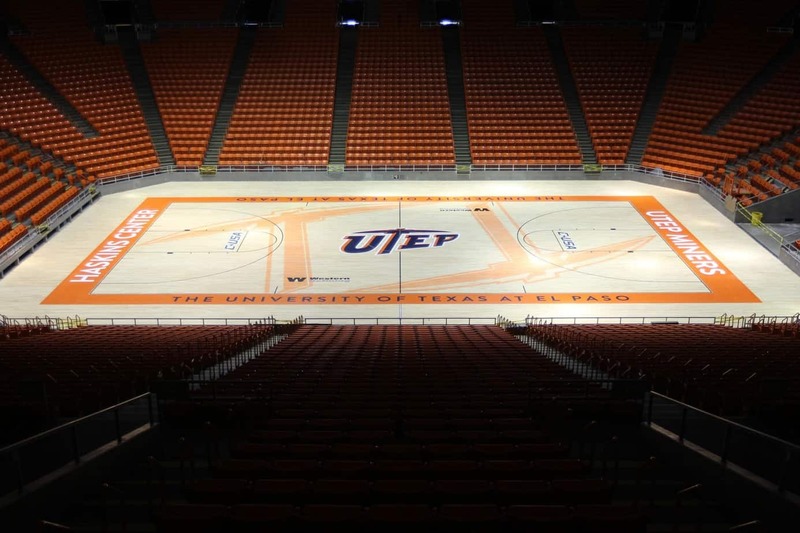 The Don Haskins Center is also used for UTEP commencements, EPCC graduations and area high school graduation ceremonies.